Long called French Cross, the village of Morden and its cross are a testimony to a people's battle for survival. It is on this beach, during the winter of 1755-1756, that 300 Acadians from Belle-Isle take refuge to escape the Deportation. The winter is harsh and between makeshift shelters and the struggle to find food, less than one-third of the Acadians survive. In the Spring, with the help of the Mi’kmaq, the survivors travel to Cape Chignecto and then the Isthmus of Chignecto to eventually arrive to Quebec. Before leaving Morden, they erect a wooden cross which remains until 1820. A new cross is erected by John Moore Oprin in 1887. In 1924, a more permanent cross is built with stones at the same location where the current cross is erected. 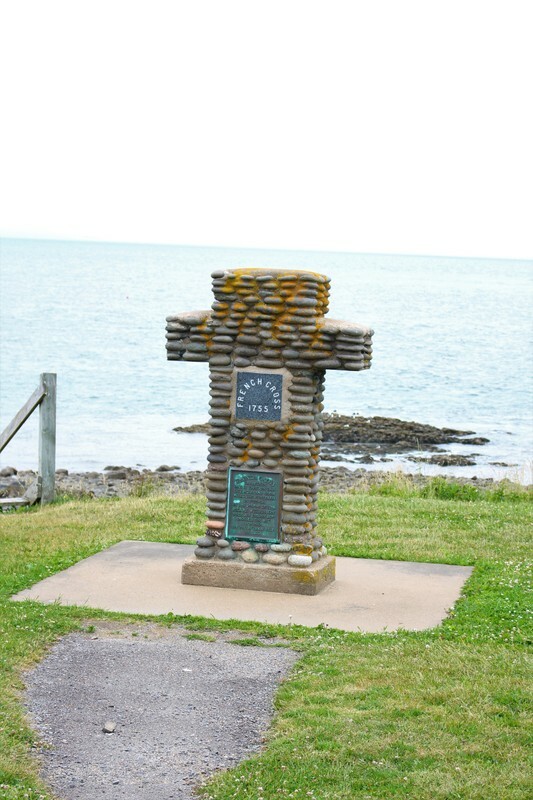 The memorial cross you see at Morden, standing on the seafront, was erected in 1964 and built out of the pebbles found on the beach. Memories abound at Morden's beach - a refuge for Acadians fleeing the British forces in 1755. During the Deportation, some Acadians from Belle-Isle attempt to cross the Bay of Fundy in order to join other Acadians, who have taken refuge in the Isthmus of Chignecto. Led by Pierre Melanson and under the advice of the Mi’kmaq, the Acadians cross the North Mountain and arrive at Morden after a deadly stop in Aylesford, later known as French Cemetery. Despite fatigue and hunger, Pierre Melanson and an Aboriginal young man continue their journey to Cape Chignecto, a 26 km trek. They however return to Morden, where Pierre Melanson dies on arrival. The few survivors of this terrible winter continue their journey to Quebec. Before leaving, they erect a wooden cross in honor of their fallen comrades. Roam along the beach and take in the cliffs and the North Mountain at this site full of history.